Spring is my favorite season. Not only for the warm weather, sunshine and budding flowers, but there is something about it that makes me feel refreshed and gets me motivated to clean and organize. I already cleaned out my closet and sold a few items online for over $50! That’s one way to get motivated to clean. I’m sure there are so many of you who feel the same and as you spend time reorganizing and decluttering your home, it’s also important to review your finances. Clutter and chaos can build up in your budget, making you feel disorganized and anxious about your money, too. 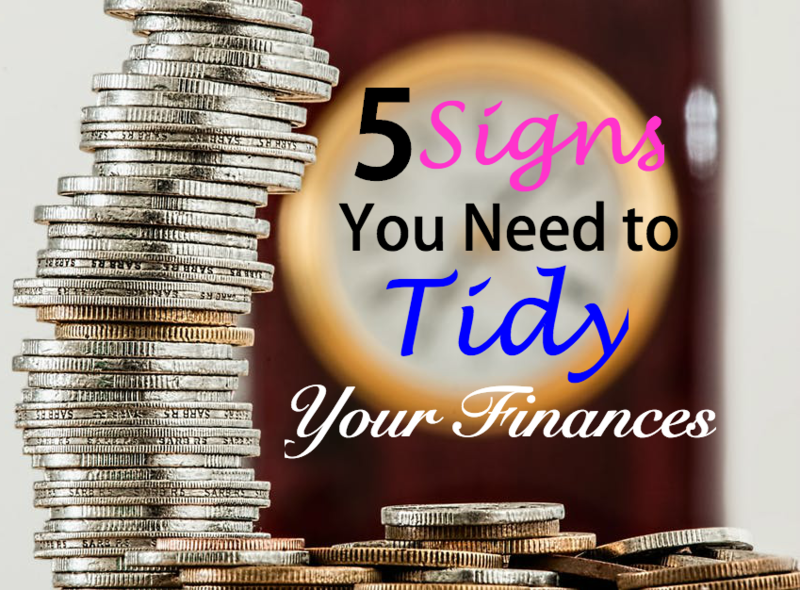 For those who don’t think it’s that important, here are 5 signs it’s time to tidy your finances. You haven’t touched your budget in months (or years). If your income hasn’t changed, you may not feel it’s important to adjust financial goals or spending. However, if you experienced a change in a life circumstance–whether you got married or divorced, had a baby or bought a house–signals a need to review and re-balance your budget. You may need to adjust budget items by reducing how much you spend in certain categories and possibly eliminating other expenses altogether. For those who don’t have a budget, it’s important to make one now. You can find free budget tools online to help you get started like BudgetPlus. Check out this article for more free budgeting tools. You have paper cluttering your drawers, cabinets and wallet. If you feel the need to hold on to every financial document, bank statement and receipt, your paper clutter may be taking over your home and wallet. Take the time to clear out documents from cabinets and desk drawers by shredding tax documents that are more than seven years old, bank statements that are more than a year old and monthly bills you’ve already paid. Then opt to go paperless across your financial accounts and keep an online filing system through your email to stay organized. For those who need to declutter their wallets, rid the mess using ShoeBoxed, which scans receipts and sends them electronically to your account to organize and store them online. Coupon apps like Coupon Sherpa or RetailMeNot allow you to access digital deals from your phone so you don’t have to worry about carrying those voucher clippings and the Notes for digital access to top deals like 20% off from Kohl’s. Also, check out Grocery IQ to turn your traditional grocery shopping list into a digital file. The less paper overwhelm in your life, the more clear-minded you will feel! You’re drowning in credit card debt. According to the 2017 Household Credit Card Debt survey from NerdWallet, the average household that’s carrying credit card debt has a balance of $15,654. Debt in any amount can keep you from achieving your financial goals. If you are carrying debt across several accounts and feel like you just can’t get ahead, it’s important to clear up these accounts and establish a repayment plan. Begin by figuring out how much you owe on each account and take note of the interest rates for each. This way you can focus on paying off the card with the highest interest fees so you save more money over time. Next, call creditors to see if they can set up a payment plan that provides a lower interest rate. Otherwise, you may benefit from consolidating your debt into one, low-interest personal loan. Not only do personal loans offer lower interest rates over credit card, it’s easier to manage one payment that’s due at the same time every month rather than trying to juggle a few different accounts. Keep in mind that local credit unions often provide low interest rates and better terms than traditional banks. You haven’t reviewed insurance policies since you first signed up. You likely (or hopefully! spent a lot of time researching options when selecting your homeowner’s insurance and auto insurance policy when you first needed it. If you’re like most people, however, chances are you haven’t touched it since. Just because you got a good rate then, doesn’t mean it’s the best rate now though. A simple search online can help you find better prices or promotions to help you save potential hundreds of dollars a year. When it comes to auto insurance, check out TheZebra.com to compare car insurance quotes from top providers instantly. Otherwise, look for ways to lower your monthly payment. As long as you have a healthy emergency fund, raising the deductible on your car insurance plan, for instance, will lower your monthly premium. You’re paying for services you don’t use. You may be experiencing financial leaks in your budget if you’re paying for a recurring subscription or membership you don’t use or for any unnecessary fees like bank fees or overage charges. Review your monthly bank and credit card statements for recurring expenses and cut the memberships or subscriptions you don’t really value or find necessary. This could be a gym membership you rarely use or a monthly beauty box. Don’t forget to review your bank account for useless charges and switch institutions for lower fees. You may even be paying for too much data on your mobile plan, so consider lowering it and monitor usage using the 3GWatch Dog app so you don’t get slapped with overage fees. For those who are paying for cable with premium movie channels and several streaming-video services, ask yourself if you’re really watching this much TV? You can probably cut back to save yourself another $20 to $50 per month. For more help, check out BillCutterz–the service negotiates your bills for you. For more ideas on how to boost your financial health, check out my recent story for US News and World Report.